Editor’s Note: This week, Bob Beach continues his discussion of evidence in the archives. This essay is based on his recent trip to the Harry J. Anslinger Papers at Penn State University. I know he was simply doing his job, but it was a strange experience. This was not my first archive trip. 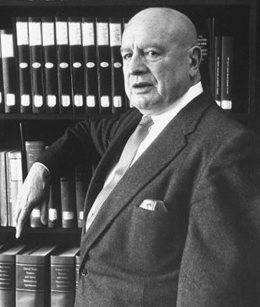 But when the gentleman in charge of the Harry Anslinger papers collection at Penn State approached, by way of introduction, I couldn’t help but notice that he was sizing me up, almost like a bouncer would size up a potential nightclub patron who looked much too young. Perhaps I should have worn a tie. In an almost accusatorial tone, he wanted to know why I was there, what I was looking for in the collection, what my motives were. He gave me a brief lecture on the importance of accurate note-taking and documentation. After a few minutes talking to him, he realized that I was a serious researcher and would not pose any threat to the collection. But he shared vague war stories about people that have been through the collection, some of whom misrepresented the collection as a whole, and some who stole documents to add to personal collections to add ammunition to what seems like a never-ending war on our first drug czar. It is obvious to anyone who studies cannabis in the 1930s why the Anslinger Papers might be a target for these unscrupulous archival pirates. Anslinger was a divisive figure during his reign as head of the Federal Bureau of Narcotics (FBN). There is the famed “gore file,” often described as a series of case files collected by Mr. Anslinger to support his contention that all marijuana users were dangerous murderers. 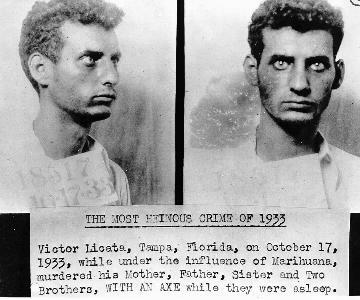 Among these were the cases of Victor Licata and Joseph Ogden, the former a young Floridian who chopped up his family with an axe, and the latter a man who beat his best friend to death and stuffed his body in a trunk. Both men, according to Anslinger, had been driven to murder under the influence of marijuana. These accounts have since been universally rejected by people on all sides of the marijuana debate. There seems to be agreement that while both men were known marijuana users, their drug use was incidental to their alleged crimes. It is also common wisdom that Anslinger’s anti-marijuana campaigns of the 1930s exploited racial, ethnic, and gendered tensions in American society and that most of his evidence is at best apocryphal, and at worst completely fabricated. So does this mean that these accounts, and the “gore file” generally, are completely useless to historians? If not, what can we learn from Anslinger’s anti-marijuana campaign? John C. McWilliams’s important corrective to the Anslinger mythology, The Protectors: Harry J. Anslinger and the Federal Bureau of Narcotics, 1930-1962, puts Anslinger’s career into perspective. McWilliams argues that the FBN’s approach to “narcotics” was less about concern over drugs and more a struggle for bureaucratic survival. An early threat to the FBN was the 1932 election of Franklin Roosevelt, and the possibility of the Democrat cleaning house. Anslinger was one of the few Hoover holdovers that remained in FDR’s administration, and McWilliams argues that it is during this time that concern about marijuana quickly evolved from a marginal to central concern of the FBN. It is within this context that the so-called “gore file” began to appear in Anslinger’s files, arriving between 1932 and 1934. The reports appear as typed, single page accounts of marijuana use, arrests and related crimes from all over the country. These “reports” are not really reports at all, however. They are brief, less than one page, often with only a date and location as identifying markers, and often with no identifying information at all. On some of the pages, a notation appears on the upper right corner, presumably in Anslinger’s own hand, categorizing the reports as “hemp,” “youth,” “traffic,” “soldiers” or “insanity.” It is unclear precisely how these reports were used, but presumably they provided fodder for his articles and speeches. But there really is no “gore file” (as described by some) to be found in the Anslinger papers, at least in the collection at Penn State. There is no organization or follow-up to any individual report, and few of the reports describe the gory violence described by Anslinger’s opponents. At the same time, these reports lack the verifiable qualities so important to archival research. To be sure, historians are more than welcome to dismiss these reports as fakes, or as too sensational to matter. However, I seem to think that these reports might have some value. So returning to Licata and Ogden for a moment. Without knowing too much about either case, it does seem (and the general consensus seems to be) that the two men suffered from some sort of psychological disorder. In an era where psychological disorders were, at best, poorly defined, there is not much we can surmise about their actual condition. It is worth speculating on the coincidence that both men where known cannabis users, however. Perhaps these two men, suffering from some undefinable internal turmoil, found some solace or relief in cannabis. We now know, based on more recent studies and a much more clearly formed picture of psychological disorder, that cannabis-based drugs may very well have some positive effects on these problems. I will allow the scientific community to make these determinations in the future. My purpose for sharing this speculation is more relevant to historians. What can we glean from the highly sensational, perhaps even fabricated accounts of cannabis use in Harry Anslinger’s professional papers? Because if there is value in fabrication, in rumor, in sensational accounts, then the Anslinger papers have been grossly underappreciated for insights into recreational drug use during this period. Somewhere in these strange reports may be a window into users’ motivations, rituals and economy, the spatial and relational aspects of their use, their contentious relationships with law enforcement, and even their daily experience. At least, it’s worth a look. An entertaining read Bob! Hope the archives proved fruitful for you. Nice post! Absolutely agree that these are things worth thinking about–motivations, rituals, economy. What would you say if I proposed that, in order to better understand the Japanese, we study anti-Japanese WW2 propaganda depicting that Asian race as vermin? I don’t mean to simply pick on the author for the idea that propaganda can be used to analyze its subject. I understand archival work and I have a Master’s in the Classics, much of which was spent on history. But have you not noticed there are plenty of former drug users alive? Yes, even a few from from the 1930s. Archive myopia may not be confined to alcohol and drug historians, but it’s far more egregious when primary sources are actually walking around you. Junkphilosopher: I appreciate and agree with all of your comments. Very well taken. The blog refers to an important, relatively new methodological approach…that of using rumor and gossip as primary sources inspired by Luise White’s recent book Speaking with Vampires: Rumor and History in Colonial Africa. Most of my project examines the period before 1930 and this technique is very much needed to research an era where no surviving subjects exist. But to be sure, I am not relying exclusively on Anslinger’s files for the thirties section of my project, other, more reliable sources and hopefully a few living beings will add to this analysis. Which brings me to your other point. I’m arguing here that while Anslinger was certainly a purveyor of propaganda, most egregiously about marijuana during the 1930s, nothing about this so-called “gore file” appears to be propaganda at all. It is just a series of “reports,” all very mundane and matter-of-fact, nothing like the Licata or Ogden stories referenced in the blog. To add a final note…a side project of mine is to preserve the perspectives of those “primary sources walking around me.” It is in the initial planning stages, but I hope to collect oral histories of today’s crop [see what I did there?] of recreational cannabis users. Because ultimately, your overall critique is exactly right, and I think it is worth preserving the voices of these users for future historians. Their voices do matter, above all. Interesting post, Bob. I received none of the scrutiny you describe during my time with the Anslinger papers at PSU. It was summer and I was the only researcher there, so maybe that had something to do with it. In any case, I must agree that the most striking thing about the Anslinger papers was how mundane they turned out for me. That was actually what I hoped to find; because I think you’re right to suggest a re-reading of the Anslinger source material. Looking forward to seeing how your project shapes up. Let’s stay in touch. The author writes, “Because if there is value in fabrication, in rumor, in sensational accounts, then the Anslinger papers have been grossly underappreciated for insights into recreational drug use during this period.” I agree that there is value in those archives and in Anslinger’s many fabrications, but surely after what the author wrote in the first part of the post that value is to be found in the insights into the paranoid style of a master manipulator, Anslinger, and not at all into recreational drug use, which he quite systematically distorted beyond recognition in his pursuit of power.